After a bit of a hiatus during the holiday months, my monthly The Weekend Gourmet Dines Out feature is finally back! 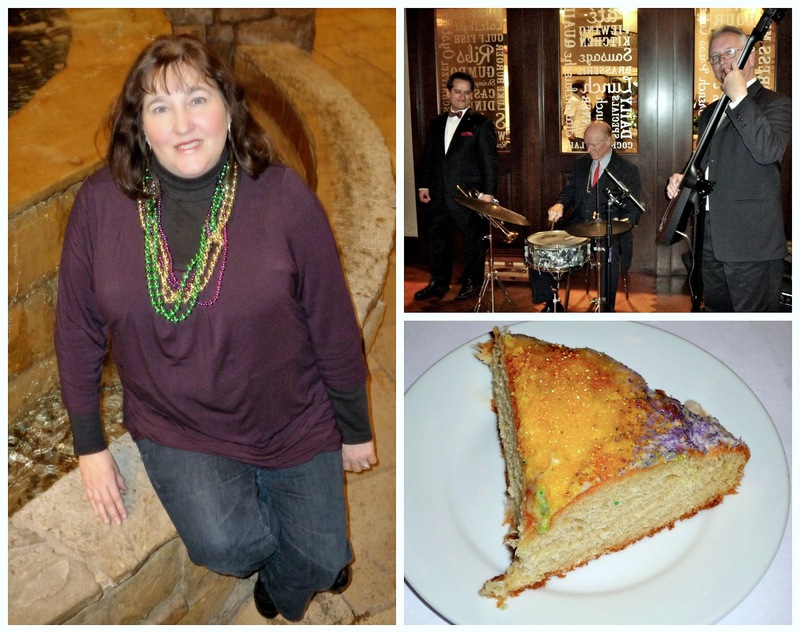 I can't think of a better way to kick off 2015's dining experiences than taking part in a fun Mardi Gras celebration right here in San Antonio. 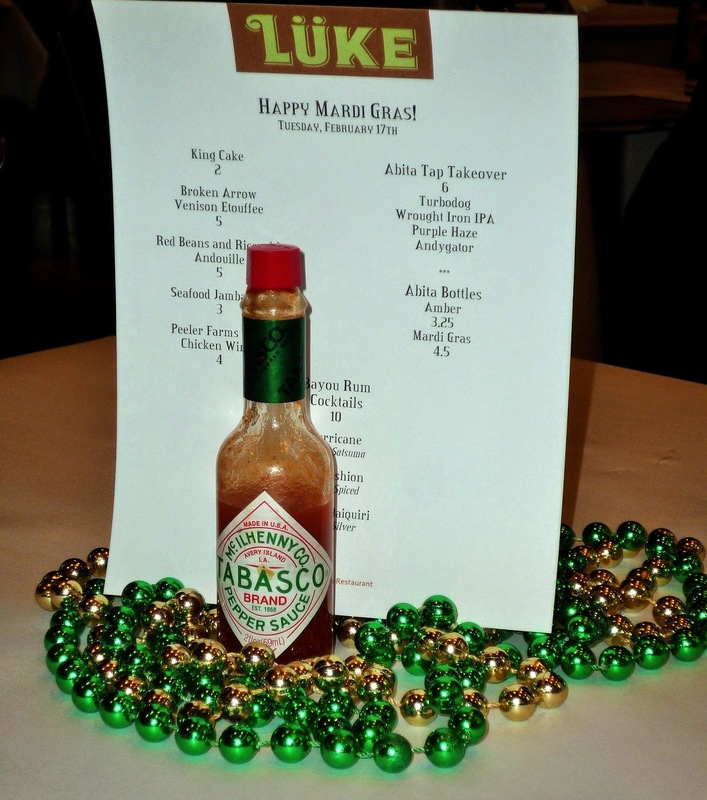 We were invited to enjoy a special taste of Mardi Gras menu at Lüke San Antonio, which is part of Louisiana Chef John Besh's family of restaurants. In fact, Lüke is Chef Besh's only restaurant located outside of his home state of Louisiana. We've dined here several times, and the food is always excellent. When we arrived for dinner, the restaurant was already hopping! There was live jazz music playing, and the staff was handing out colorful Mardi Gras beads to those lucky enough to have a reservation to this fun event. We were quickly seated and looked over the evening's special menu offerings. Because the items served were reduced-sized menu portions, we were able to sample all five of the menu offerings. Add in a couple of tasty Mardi Gras cocktails, lively music, and some colorful beads...and our Fat Tuesday dinner was off to a great start! We started the fun by ordering a pair of Happy Hour-priced New Orleans-inspired cocktails: a Texas-sized Bayou Satsuma Hurricane and a French 75. Both were expertly made and very tasty. The hurricane was served over ice in a carafe, and it was fruity and delicious. Sort of like punch on steroids! Michael's French 75 was made with champagne, cognac, and lemon. It reminded me a bit of a sophisticated fizzy lemonade. 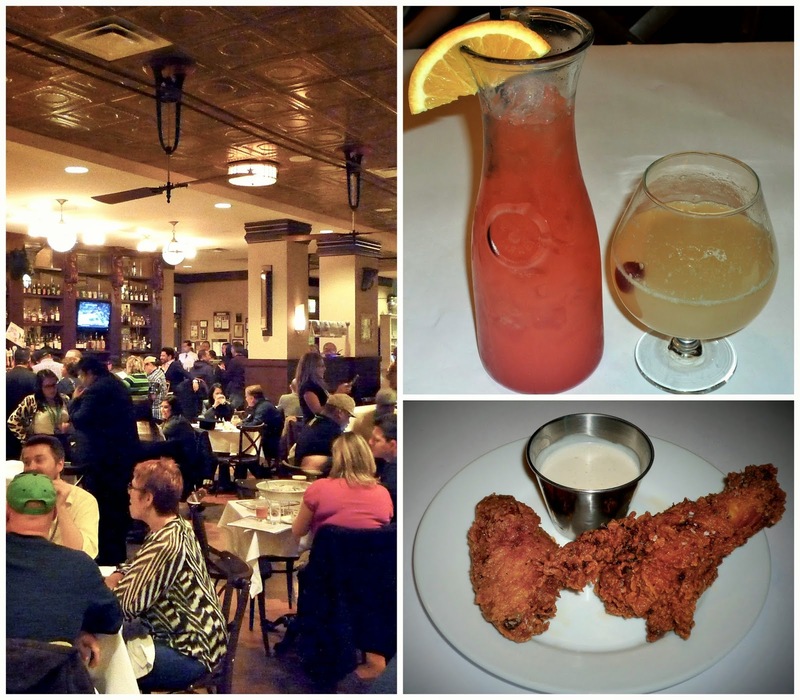 We sipped our cocktails, which came served with a duo of locally sourced Peeler Farms Fried Chicken Wings. The wings were fried perfectly crisp, with a sprinkle of coarse sea salt and a fabulous house-made buttermilk dipping sauce. As we sipped our cocktails, we had a great time people watching and listening to the live music the jazz trio was playing. This is my kind of Mardi Gras celebration -- lots of great food and drink -- without huge hordes of people! The other guests seemed to be having a great time too...and the staff at Lüke were in a festive mood. Next out of the kitchen was a four-course sampler of Louisiana specialties from Chef John Russ' kitchen. We enjoyed a second round of the amazing Peeler Farms Fried Chicken Wings, Red Beans and Rice with Andouille, Seafood Gumbo, and Broken Arrow Venison Etouffee. All four items were expertly cooked and so flavorful. 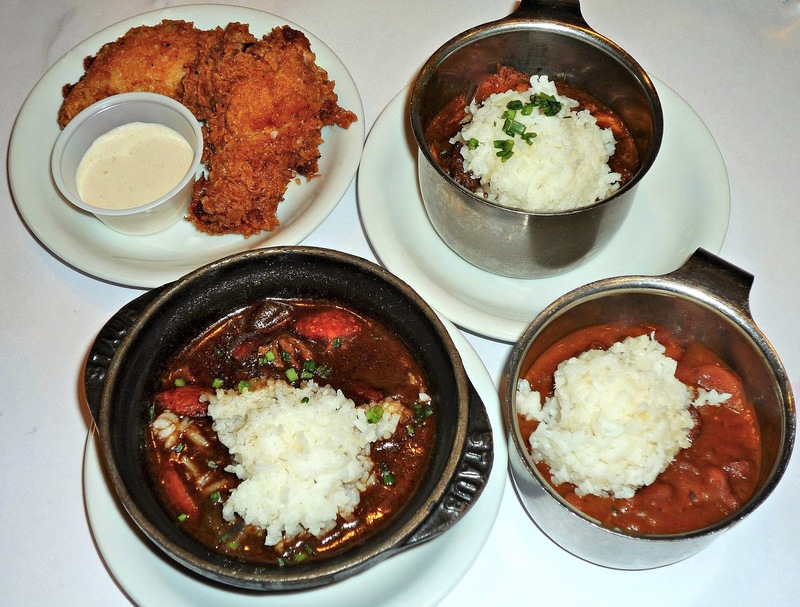 The gumbo was just the way we like it: rich and dark, with tons of delicious seafood. The red beans and rice were cooked perfectly creamy and smoky, and the venison etouffee was meaty and flavorful. We enjoyed our dishes with buttered, hot-from-the-oven French bread. This meal truly was a taste of New Orleans! We ended our meal with the traditional Mardi Gras dessert: King Cake. If you've never had King Cake, it's a New Orleans Mardi Gras tradition. The flavor reminds me a bit of a sweet roll. The cake is yeast-based and lightly sweet, then it's topped with a sweet glaze. King Cakes are decorated with green, gold, and purple sugar on top -- which are traditional Mardi Gras colors. Tradition also says the person who finds the little plastic baby that's hidden in the cake in their piece either buys the next King Cake or hosts the next Mardi Gras party. We didn't find a baby in our dessert, but we did enjoy its citrusy flavor! After our meal, we stopped at the entrance to listen to the jazz trio play for a bit longer...and then Michael snapped a picture of me with my Mardi Gras beads. Lüke San Antonio is conveniently located on the Riverwalk, making it a great place for both locals and visitors to visit. The restaurant is located inside an Embassy Suites hotel, making parking very easy. Simply drop your vehicle with the valet at the front of the hotel and walk through the lobby and into Lüke -- no searching for a parking lot Downtown and walking. You'll even pay a reduced parking rate by using the hotel's valet to park your vehicle. Lüke offers a very popular Happy Hour with nightly specials, as well as a fabulous weekend brunch. Disclosure: Lüke San Antonio invited us to attend their Mardi Gras celebration to facilitate this feature. No further compensation was provided, and all opinions expressed are solely my own.